Seasonal decorating makes the ultimate stylish statement in your home while keeping it looking fresh throughout the year. In the summer it’s all about floral cushion covers, leafy green plants and pretty patio furniture. Whereas in the winter it’s all about cute scented candles, fluffy sofa throws and sparkly fairy lights. Now that winter is well and truly here, its time you give your home that wonderful winter makeover. 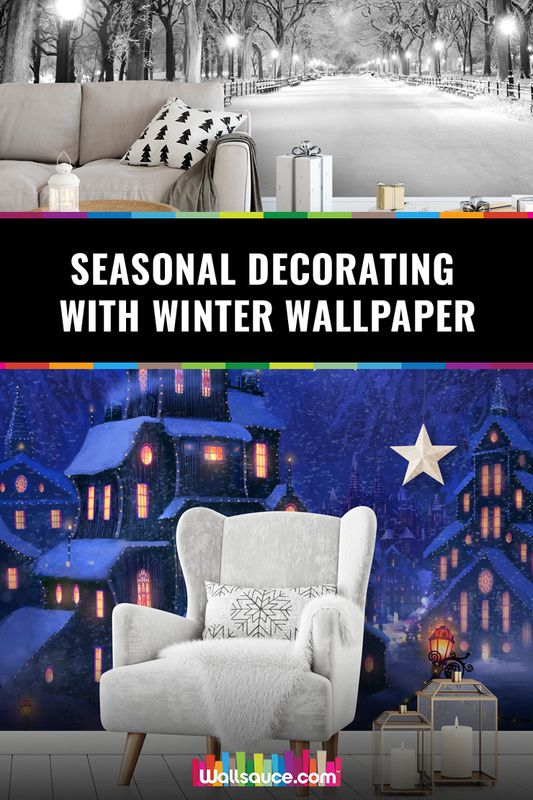 However rather than mess about with buying various bits and pieces for your home (that you’ll only end up storing away after the season is over) you can simply choose one of our winter wallpapers to create that seasonal statement. A stunning winter feature wall will look amazing in your home and save you so much time and hassle when it comes to seasonal decorating. By having your wall as the main statement you don’t need to worry about adding other accessories apart from Christmas decorations. All of our winter wallpapers are available to order in three different types of wallpapers: Classic 'Paste the Wall' Mural, Premium 'Paste the Wall' Mural and Textured 'Peel & Stick' Mural. Our peel and stick wallpaper range is a popular choice for winter wallpapers, as it’s easy to apply onto your wall and just as easy to take it down once the season is over. 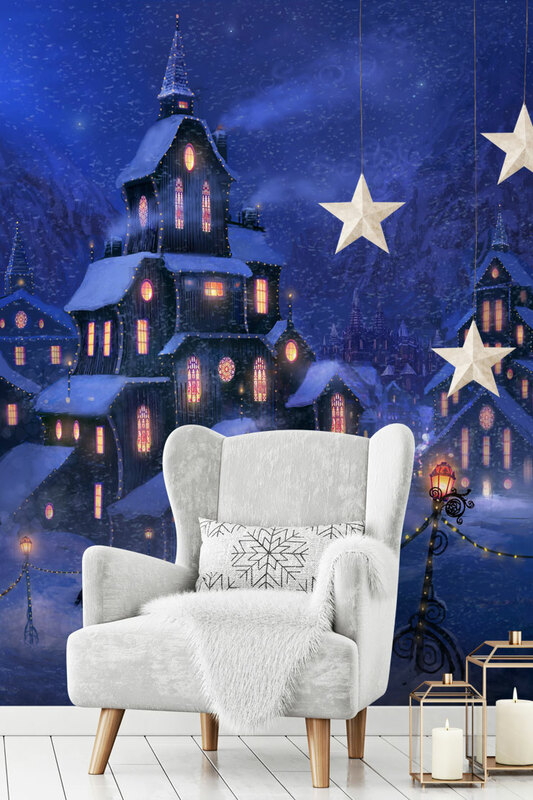 Take a look at our selection of winter wall murals to transform your room into a winter wonderland and create your own little cosy retreat from the outside world. We have picked three gorgeous photographic winter wallpapers that show off the brilliance of nature during this season. You can bring the snowy outdoors indoors without having to put your big coat, woolly hat and gloves on. Is there anything more magical than wintertime in New York City? 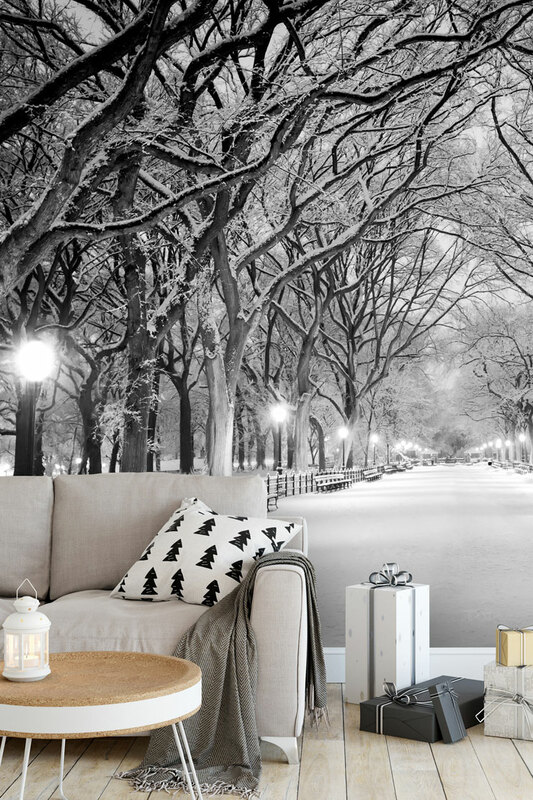 This classy black and white winter wallpaper mural captures New York’s infamous Central Park in a stunning snowy setting. The simple and scenic sight of this frost wall mural will make a beautiful feature wall in your living room. The frosty lake with the reflection of the tree makes this a very pretty visual to look at. You can create a snowy, glowy feel in your living room with this sunset in the woods mural. The thick snow covering the ground with the sun going down behind the tall trees makes this photo wallpaper mural look truly spectacular. Animal lovers need not look any further for the perfect winter wallpaper. We have picked three beautiful photographic winter wall murals, which include lots of furry friends for your living room. 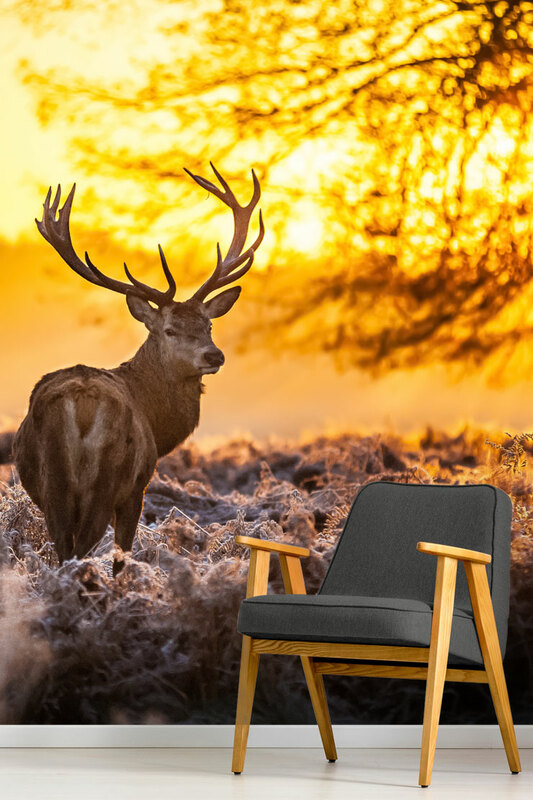 This red deer wall mural effortlessly captures the beauty of the morning sun against the frosty ground. The way the deer is in the middle of the setting and is looking back almost at you will make a spectacular feature wall. How adorable is this polar bear family of three mural?! This wallpaper mural will make all your guests say “awwwww” as soon as they step into your living room. It’s a super cute way to bring the magic of winter into your home. This wolf photo wallpaper certainty makes a WOW statement with a stunning wolf staring into the distance. The blurred forest background brings makes the wolf stand out and makes quite a striking image to have in your home. 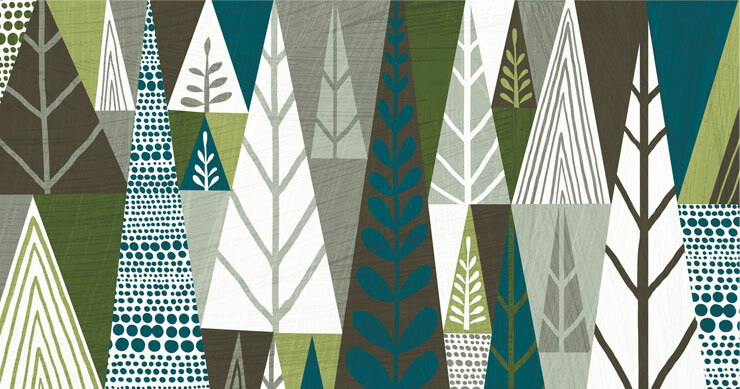 You really can’t go wrong with a pretty pattern when it comes to winter wallpaper. Here are three of our favourite patterned wall murals that will bring all the wintery vibes to your home. This gorgeous wallpaper mural is part of the Michael Mullen collection. The interesting use of triangles as trees combined with the leafy pattern makes this wall mural an unusual yet lovely vision to look at. 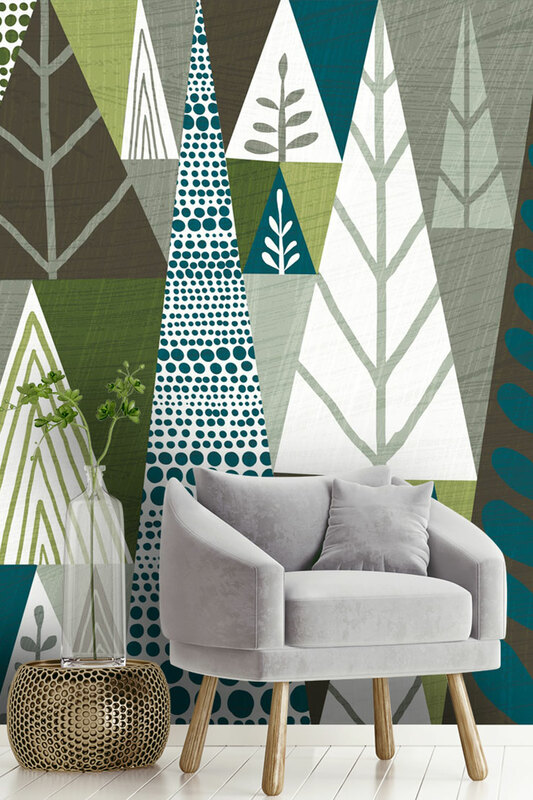 This winter wallpaper mural has a more neutral feel to it with the light choice of colours. The pretty pattern of deer combined with trees and drops of snow makes this mural an elegant feature wall to have in your home. The pretty snowflakes in this wall mural will bring all the wonderful winter vibes to your home. The contrast of the dark grey background with the different coloured snowflakes on top makes this mural an interesting and stylish print to look at. Illustrations wall murals will bring that cool, arty vibe to your home. An illustration winter mural has something rather enchanting about it with the vibrant colours, attention to detail and the unique design. This illustration is by Philip Straub and shows a windswept snowy scene with two people heading towards the building. The mixture of the dark blue of the night and the yellow of the lights will make this mural a fabulous feature wall in your home. The majestic beauty of this wolfpack wall mural will create a show-stopping feature wall in your home. Set in a snowy scene with the moon shining in the background with a pack of wolves in the middle, this wall mural will make a stunning addition to your home. This winter games mural by Trevor Mitchell and captures a snowy winters day in a little town. The amazing level of detail in this mural makes this a picturesque scene to have in your home. At first sight, you will notice the family and children playing in the snow and in sledges, however, if you look a little closer you will see a shop, snowman with a scarf on, a little robin in a tree, a post-box, a phone-box and gnomes in the snow. If you enjoyed this blog post, you may also like to read our post on Christmas murals to suit every type of office. Alternatively, we welcome your ideas on creating a wonderful wintery scene in your home in the comments box below.